East Meets East is a discussion and exploration of the history and theology of the Assyrian Church of the East as understood within the discourse and framework of Eastern Christianity. The aim of the blog is to explore the primary and ancient sources of the Assyrian Church of the East to better comprehend the theology of the Church of the East. One of the most common misconceptions about the Assyrian Church of the East is that she does not use icons or is even averse to icons. For many Assyrians this would seem natural and correct as they have not seen icons in their worship and may have been told that the Church of the East rejects icons. All other ancient Christian traditions have icons and it may be shocking to think of an Apostolic church without icons. The concept that the Church of the East does not have icons in her tradition is a myth. The Assyrian Church does not currently make large use of icons, but they are indeed present in her tradition. The evidence for the use of icons is plentiful, continues well into the fortheenth century, and is found in core documents, canonical writings and liturgical texts. Furthermore, throughout my research I have found no mention of any supression of icons. In this post I’ll provide several examples of the way icons have been written about by the Assyrian Fathers. At a later date I will provide additional information on the topic, as there is much more material to cover than can be enumerated in a single posting. Now the Abgar account is not easily verified by history, but is a matter of faith especially for Syriac and Armenian Christians. It forms a vital part of the identity of the Assyrian Church. It is where Assyrian Christians trace their spiritual roots to as much as St Peter for Rome or St Mark for Alexandria. The Church of the East’s earliest historical document includes the first recorded attempt to produce an icon of Our Lord, God and Savior. Notice what it calls the icon: the depiction of the Lord’s human appearance. This will become the title of the Mandylion icon (“Made without hands”) in later texts of the Church of the East. The Church of the East, beyond other traditions, fixes the tradition of the icon as a direct inheritance from Our Lord himself and, since before iconoclasm, recognizes the Christological impact that icons have. God the Son was incarnate and therefore we can depict the Son of God in his humanity. “And now they put all of the sacred vessels, with which they serve the holy mysteries: the paten and chalice and fans; the icon on high, and the aer and veils and stoles; and the vestments of the altar: except the cross and Gospel-Book. (ܛܟܼܣܐ ܕܟܗ̈ܢܐ ܕܥܕܬܐ ܕܡܕܢܚܐ܆ܡܫܠ̱ܝܐܝܬܼ ܐܝܟ ܛܘܟܣܐ ܕܕܝܪܐ ܥܠܝܬܐ، ܩܫ܊ ܝܘܣܦ ܕܒܝܬ ܩܠܝܬܐ، ܡܘܨܠ. 1928. 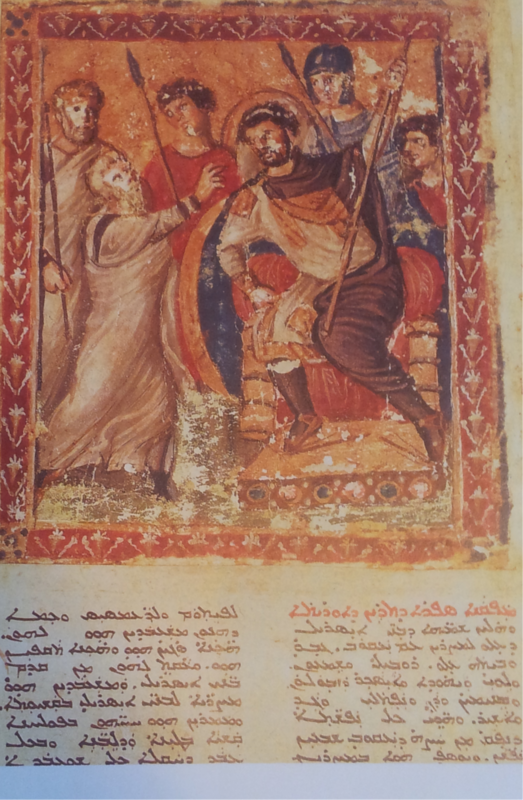 ܦܬ 399”) (Priest Service Book of the Church of the East, Ed. J. Kelaita (Mosul, 1928), pg 399-400). The Rite of Consecrating an Altar with Oil dates to Mar Ishoyahb III, the Patriarch (649-659) who has a tremendous impact on the canonical offices, three liturgies as well as sacraments of the Church of the East. The rite as contained in the current and official Priest’s Service Book contains the rubric and it has not been amended to discount the role of the icon. When an altar is consecrated, the rubrics still require the icon although it has not been done in practice for some time. Indeed, according to this rite, the icon on high is counted amongst the necessary items needed to serve a liturgy, not within the secondary items such as the censer, zone-belt, alb, service book, etc. The icon, infers the rubric of Mar Ishoyahb, is essential rather than optional for every liturgy. The Church of the East not only venerates icons but she equates them with the Holy Cross and the Holy Gospel. This places the icon purposefully with the most revered objects of the Assyrian Church and not as a mere incidental to worship. Why icons disappear from common use is a great question for a future entry (or perhaps a reader to investigate and share with us). I personally suspect the rise of Islam, which is intensly iconoclastic, as a cause of the current lack of icons. The whole church prays the above Anthem, during the liturgy on the Feast of the Cross. When an altar is anointed the clergy read the rubrics requiring the placement of the icon. While the matter of Christology requires study and dialogue, it is clear that icons are really part of the tradition, but a neglected part. The lack of icons does not mean a lack of venerating the Christ-sanctified matter of the Cross and Gospel-book. Indeed, in every Assyrian Church there are veneration stands (proskynisitaria/analogia) with a Gospel-book and cross. They are venerated on entering the church, before receiving the precious gifts and when one leaves. Some images of ancient icons of the Church of the East, more bits of evidence, and some examples from Church architechture and cited use of icons will be the topic of a future post. My hope is that when my fellow Assyrians communicate about their faith with my fellow Orthodox Christians, the rejection of icons might not be a point of separation. Indeed, it is not only Orthodox Christians who can learn about the Syriac heritage of the Church by encountering the Church of the East, but Assyrians who can learn about forgotten bits of their own history by encountering the challenge of learning about and describing their Church to the Orthodox. In the account of Abgar the Blessed, we see that the intention is to produce a painted icon. Christ helps them by producing the first icon, "Not Made by Hands". Christ himself gives the prototype for icons here, albeit mystically. This is interpreted by the Church, very clearly, as the first icon and that which is the model and cause of sacred imagrey. Christ does not tell them not to kiss his image or that it would be idolatry. Instead, Christ himself institutes icons as a connection to him personally. He gave us icons like someone might give a photograph before departing on a voyage. The Gospel is the holy word of God. The cross is the dwelling-place of God’s glory in a mystical way due to it being the sign of our salvation. The icon of Christ is the proof of His human nature by which we see the divine person. Icons are found in every tradition, East and West, so they are not just a local practice but a part of the “Tradition of the Church Catholic and Universal”. The majority of the evidence is that icons are very, very old. There is a holy saying by St Vincent of Lerins that describes a great criterion of what is Christian orthodox Tradition(haymanutha TriSayta): Quod ubique, quod semper, quod ab omnibus or "Whatever is everywhere, always and [believed] by all". Icons were used by Christians from Persia to Ireland; from Ethiopia to Germany. That also means they are very ancient in their use. We do have icons, like the Pantocrator of Sinai and the images on sarcophagi that date the first centuries; none more important than the Icon, Not Made by Hands, of Edessa. Furthermore, Icons, and carved images on tombs, are some of the oldest Christian artifacts we have. The evidence is the Assyrian Church had icons. There would be an icon, Not Made by Hands/Mandylion, above the altar. There also would be one of the Blessed Virgin and, probably, the patron saint—I can cite multiple sources for icons of “the blessed” and of the saints. I imagine Assyrian Churches used fewer icons than the byzantine world and that each icon would have been considered very sacred due to the generations that venerated it. We don’t have many examples of Assyrian icons left, I don’t think. Therefore, I would tend to imagine they were treated more like relics. Hi, I am Assyrian, and I am visiting Cyprus in one months from now. So need to ask you guys if there is any kind of an Assyrian community in Cyprus? Onother thing is if you have any addresses to some Assyrian church to visit ? eaven the old ones. The "Nestorian" Church of Famagusta, Cyprus, has vestiges wall paintings of saints with Syriac inscriptions. Indeed, there was a Church of the East community on Cyprus. The icons are quite beautiful. I'd love to see a comprehensive study on Assyrian iconography done in English. The more I learn the more my presuppositions are challenged. For instance, I always imagined Assyrian iconographical use being a Mandylion above the altar, perhaps an icon in the BethGazzeh (equivalent to prothesis table as used in liturgy) and a Christ and Panagia/Blessed Virgin on either side of the sanctuary door. Basically, that the Church of the East was more primative and sparse in her use of icons. Famagusta seems to suggest otherwise. The Church of the East's churches may have been rich in iconography of a varried sort as is St George's show in your link. Hi, I am Assyrian, and I am visiting Cyprus in two months from now. So need to ask you guys if there is any kind of an Assyrian community in Cyprus? By the way Father, the image you have posted is not of an icon, but of a manuscript illumination depicting Moses before Pharaoh. Manuscript illuminations and icons are two different things, and serve different purposes. For instance, icons are revered while manuscript illuminations are purely for illustration. So what might be a way forward for the Church of the East to recover the proper use of Iconography? There are a few isolated instances of the use of art in the present day church. I hope the practice continues. Can you please send me more material or where I can find more information on icons in the Church of the East because I am Assyrian and I truly believe the Icons should be brought back to the Church of the East. My purpose in creating this blog is to explore the history of Christianity that developed East of the ancient Roman world and which is called today The Holy Apostolic Assyrian Catholic Church of the East. The church is in no way a member of the Roman Catholic Church but has the term Catholic in much the same way that all Orthodox Christians use the term. It has also been called the Assyrian Church of the East, The Church of the East, The Persian Church or, unofficially and somewhat in a derogatory manner, the Nestorian Church. In this blog we shall call her The Church of the East. Here is my attempt at a succinct definition of what the Church of the East is in short paragraph. Christianity developed throughout the Roman Empire and by the forth century crystallized as the pentarchy of the patriarchs of Rome, Constantinople, Alexandria, Antioch and Jerusalem. At the same time, the Gospel was preached and received in Mesopotamia and went out across the Persian Sassanian Empire (although it may have begun during the late Parthian period). This Church of the East structured around the bishop, later Catholicos Patriarch, in the capital of the Persian Empire, Ctesiphon, and she missioned across Asia through Afghanistan, India and across to China and Mongolia. The Church of the East is Christianity as developed East of the traditional and ancient Eastern Orthodox world, sharing much theologically and philosophically with Greek speaking Christianity and yet remaining in practice and polity independent. The first great task will be to understand why Eastern Orthodox do not share a communion with the Church of the East. This exploration is meant as a study of a ancient Eastern Christian Church that developed wholly within a pagan (later Islamic) world, which was ambivalent at best and genocidal at worst to the name of Christ.